Industry Experts, Inc. published the global market report on Biopsy Devices. The new report entitled “Biopsy Devices – A Global Market Overview” reveals that the global market for Biopsy Devices is forecast to touch US$2 billion in 2018. Diagnosing cancer in its initial stages may prevent the mortality rate. As per the international Cancer Agencies, the cancer incidence rate may reach 23 million by 2030 that indicates urgency of the arrival of maximum number of less invasive, more efficient and accurate diagnostic devices like Biopsy Devices in to the market. Biopsy Devices are recognized as the most essential tools not only in the diagnosis and treatment of cancer but also in detection of cancer stage. Rising cancer incidence and prevalence rate, increasing demand for minimal invasive protocols, existence of large geriatric population, growing public awareness about the diseases and diagnostics options, emerging nascent biopsy techniques, assistance offered by the government and global health organization are some of the factors contributing to the growth of the Biopsy Devices market. Guidance Systems lead the global market for Biopsy Devices as the single largest product type, demand for this type accounts for a share of 43% in 2017 and projected to remain the largest type by 2023 as well. The report reviews, analyses and projects the Biopsy Devices market for the period 2014-2023 globally, and the regional markets including North America, Europe, Asia-Pacific and Rest of World. The regional markets further analyzed for 15 independent countries across North America – United States, Canada and Mexico; Europe – Germany, France, Italy, Spain and The United Kingdom; Asia-Pacific – China, Japan, South Korea, India and Australia; and Rest of World – Brazil and South Africa. Biopsy Devices product types market analyzed in this study includes Guidance Systems, Needle Associated Guns, Forceps and Other Biopsy Devices (constitutes Biopsy Curettes, Biopsy Punches, Biopsy Shaves, Biopsy Trays etc.). The market for major applications of Biopsy Devices explored in this report comprise Breast, Gastrointestinal, Prostate, Respiratory System and Other Applications (includes Skin, Liver, Pancreatic, Nerve, Muscle, Kidney, Bone and Bone Marrow etc.). The report also examines the market for end-use segments of Biopsy Devices consisting Hospital, Diagnostic Care and Other End-Use segments (includes Research Units, Educational Centers, Ambulatory Surgical Centers etc.). 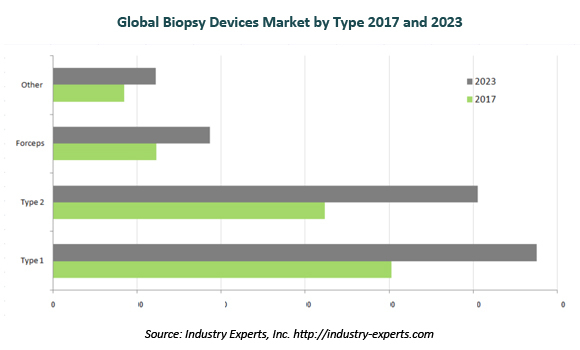 This 380 page global market report on Biopsy Devices includes 294 charts (includes a data table and graphical representation for each table), supported with meaningful and easy to understand graphical presentation, of the market numbers. The report covers the brief business profiles of 14 key global players and 20 major market players across North America – 11; Europe – 7; Asia-Pacific – 2. The report also provides the listing of the companies engaged in research and development, manufacturing, supply and distribution of Biopsy Devices. The global list of companies covers the address, contact numbers and the website addresses of 217 companies.